Outdoor interpretive panels on site share the story of the Fenian Raids in Fort Erie, from the reasons why, the local, provincial and international response and the outcome. Open year round. The Ridgeway Battlefield site marks the location where Irish-American veterans of the U.S. Civil War fought Canadian forces in an attempt to gain Ireland's independence of England in June 1866. The invading force of more than 1,300 met no resistance in crossing the Niagara River on June 1, but two battles were fought the next day. Ten Canadians were killed and 38 wounded near this site, while six were wounded and 36 captured at Fort Erie after the invading force retired back to the river. A U.S. gunboat prevented reinforcements of 10,000 waiting to cross and join the invasion and the invading force of Fenians retreated back to Buffalo. Designated a national historic site, a commemorative cairn was erected on Highway 3, near Ridge Road, close to the battlefield, and a cabin which stood at the battle site is maintained by the Fort Erie Museum (see photo below). The first record of the building that sits on the Battlefield Site dates to 1822 when Zachariah Teal purchased it from John Silverthorn. In 1916 the Roadhouse family bought the house and later donated it to the Bertie Historical Society in 1975. The Town of Fort Erie took over the operation in 1976. With assistance from the Ridgeway/Crystal Beach Lions Club, the house was moved to its present location and renovated. Visitors wishing to learn more about the Battle of Ridgeway or the Fenian Raids can visit the Historical Museum, 402 Ridge Road. Items on exhibition include a unique series of period paintings which give a visual account of the Battle of Ridgeway. These original watercolours were painted by Fenian sympathizer Alexander Von Erichsen who accompanied the invaders. They depict the events from planning stages to subsequent court trials. In June 1991, the fields surrounding the Battlefield Museum were the scene of a reenactment of the Battle of Ridgeway. 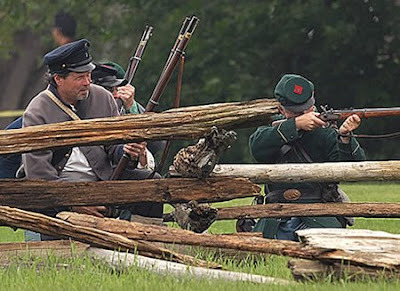 Hundreds of living history volunteers from Canada and the United States recreated battles and encampments for more than 13,000 appreciative visitors. A video of the reenactment is available for viewing or purchase at the Historical Museum.